Jennifer Heath is a businesswoman. She doesn't actually work for the CIA; she's the co-owner of a successful antique shop in New York. Member of an upper-class family, daughter of a famous author of popular cookbooks, Heath has had a love of antiques all her life and has her own personal collection of unique items she is quite proud of. She has been in the antique business since she had graduated from Syracuse several years before. Her frequent buying trips overseas on behalf of her and her partner, looking for bargains and items that would turn a profit, would provide excellent cover and thus makes her a perfect candidate to be approached by the Agency, though at the start of the two-book series that has not yet happened. Her independent streak and an as-yet untapped love of adventure makes her unlikely to say no for long. Note: At least one other listing of the Jennifer Heath series includes the book Chase The Sun and in the inside of the second book in the series there is a promo that coming soon from Dell is Chase The Sun. However, I have found no copy available for sale anywhere and the author’s own website, www.elisetitle.com, listing of the books she has written does not include this third title though it does list the first two. This leads me to believe it was planned and possibly written but not actually published. Stepping into a street in Rome to be suddenly facing a man holding a gun was the first shock that Jennifer Heath felt. The next was seeing that same man outbidding her at an auction. Soon the two are forced to work together to just stay alive. Joining again with her lover, Jennifer Heath aids in stopping a plot to sell weaponry which takes her from Monte Carlo to the mysterious Martinique. 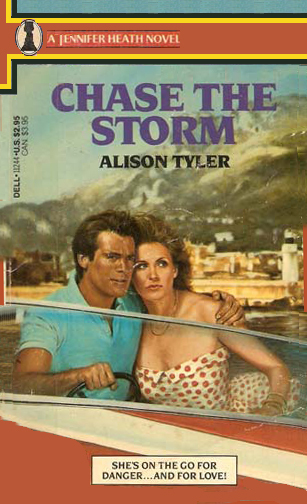 Never a big fan of romance novels, I took a deep breath and started in. Then I breathed easier. These are well-written, very enjoyable stories. I like Jenny and wish there had been more. Of course, if the other book I mentioned which I cannot find is one in the series then there is more but I cannot find it. 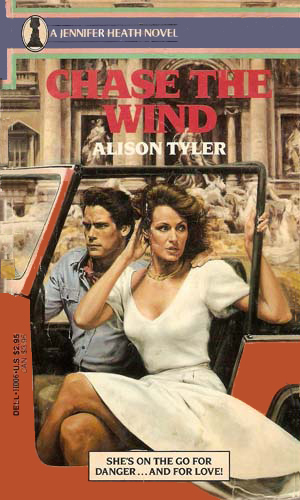 Alison Tyler's writing could make a romance convert out of me. Jenny is such a sweetheart that you can't help but love her. And you have to know that the guy she is with is really a lucky guy. I would have to learn how not to blush so much at some of the steamier passages. Oh my!